We are the leading manufacturer, exporter and importer of Finger Cots. 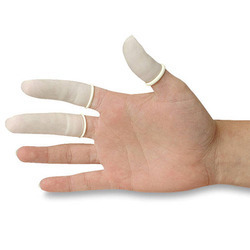 Being a reputed name in this domain, we are passionately dedicated to offering a comprehensive array of Finger Cots. Made using best quality nitrile the given product is extensively demanded by hospitals, clinics, dispensaries, research centers, etc. These are reckoned in the market owing to their tear resistance, chemical resistance, and perfect sizes. Customers can avail these from us in white colors. Further, we provide these at cost effective rates.